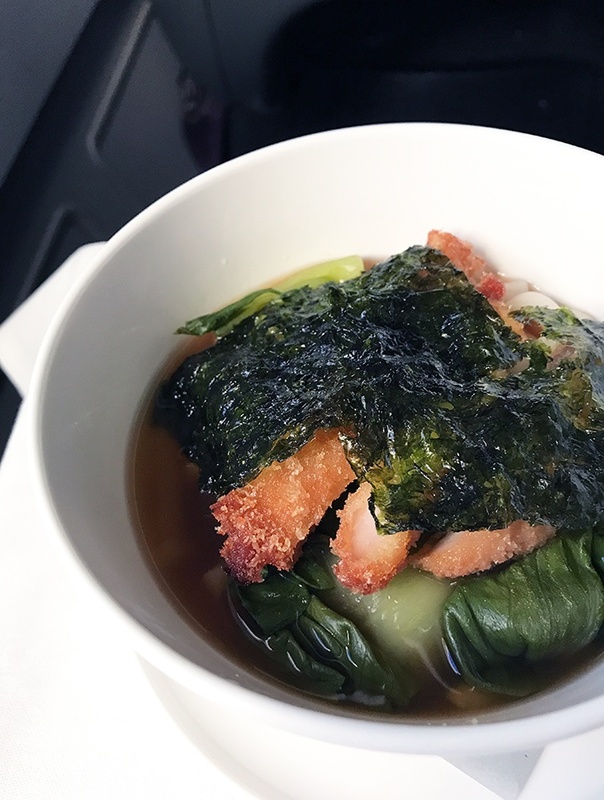 Review of Qantas business class Sydney to Singapore. Flight QF005 on the Airbus A330-200. 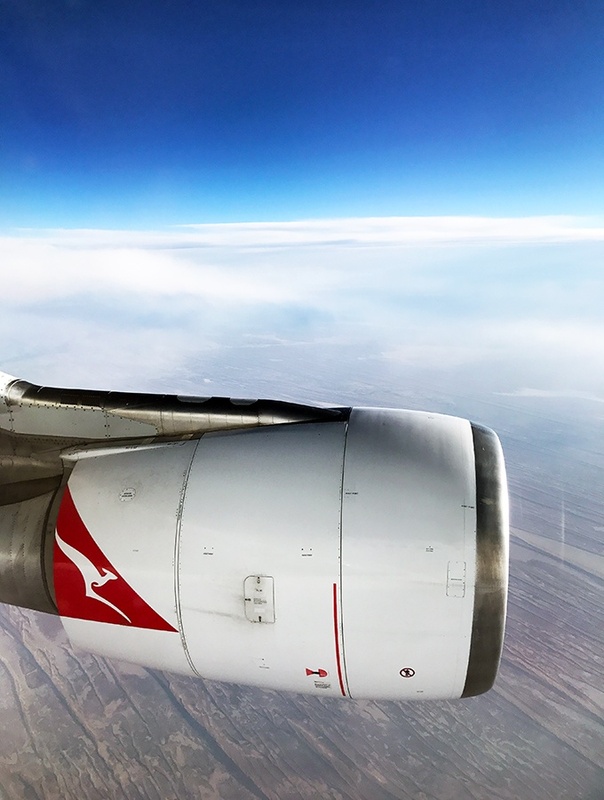 Considering I fly Qantas frequently I am a little shocked that this is the first flight review I have written about them. You have surely seen the new Qantas business class suites advertised, don’t they look amazing! 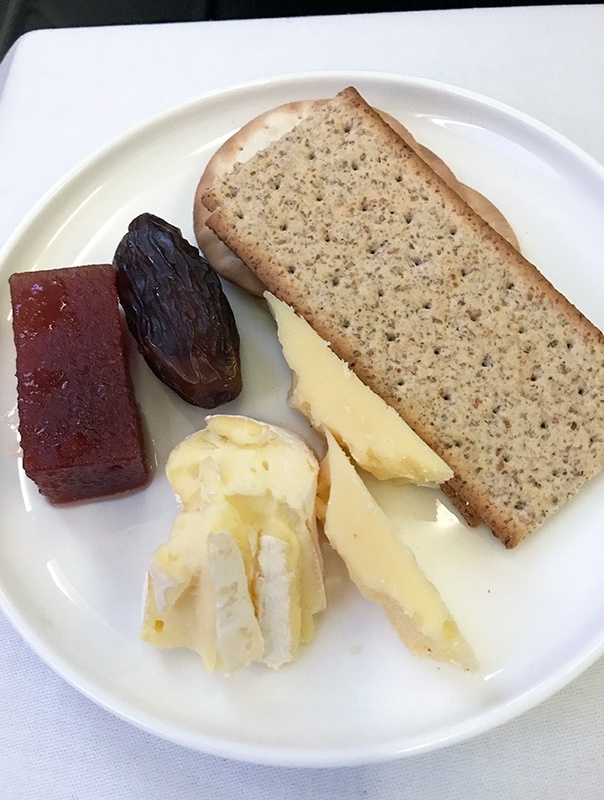 Qantas is slowly refurbishing their fleet with the new business class suites, and unfortunately, this flight wasn’t one of them. QANTAS has a dedicated check-in for their business class passengers. If you are a QANTAS Platinum, Platinum One Frequent Flyer or hold Oneworld Emerald status you will be able to check in via the first class counters. We are here early and check in is courteous and speedy. We are given express passes to help get us through immigration and security quickly. As I have found the past few times the express passes didn’t really make much difference, as there weren’t any lines. But these passes are a Godsend when it is busy! There is a lounge for you to enjoy before your flight if you are in business class. You will also have access to the lounge if you are a Qantas Club Member, hold QANTAS Frequent Flyer Gold Status or Oneworld Sapphire. 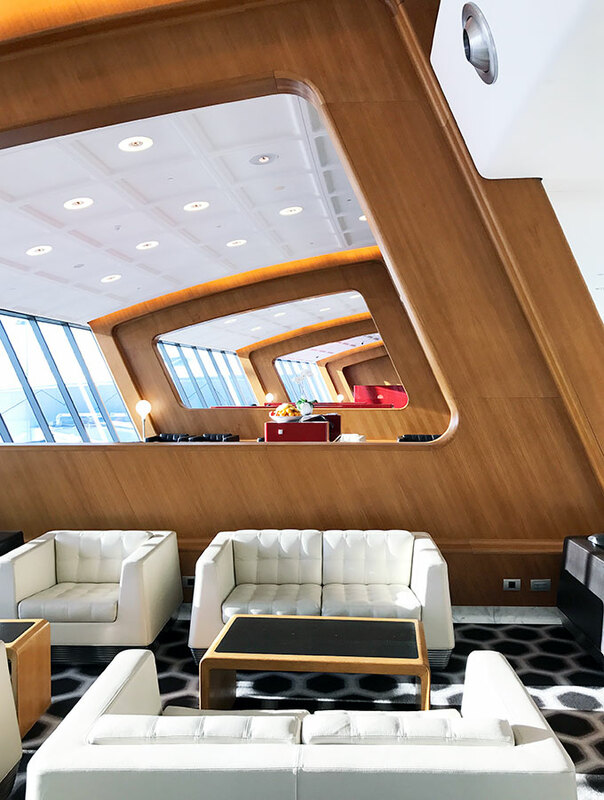 Instead, we head to the Qantas First Class Lounge that is accessible no matter what class you are flying if you are Platinum, Platinum One or Oneworld Emerald. Yes, it is a lot fancier than the Qantas Business Lounge and a lot quieter. Unlike the Business Lounge, the First Lounge has a dining area with table service. 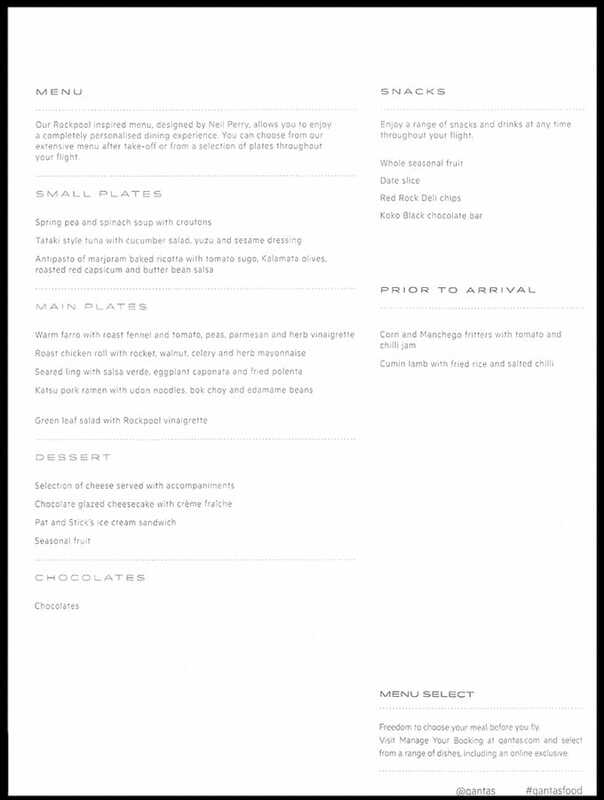 Neil Perry is the celebrity chef behind Qantas dining, and I find the seasonal menu always well put together. The food is always better than what is served on the plane, even if travelling business (I’m yet to travel first and probably never will). 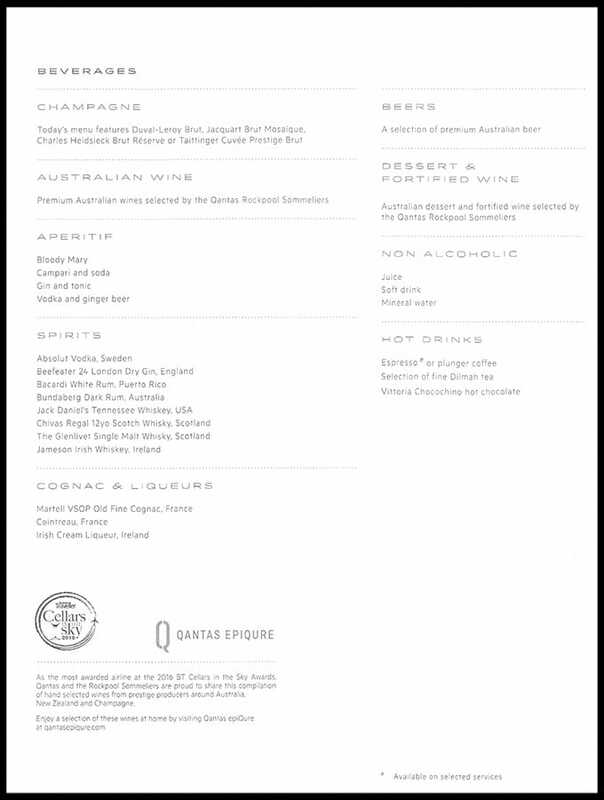 So, of course, we order a pre-flight dinner. When boarding we are greeted warmly and guided to our seats. Once seated and settled we are offered a pre-flight drink. After having a few glasses of Champagne in the lounge I decide on another glass of bubbles. 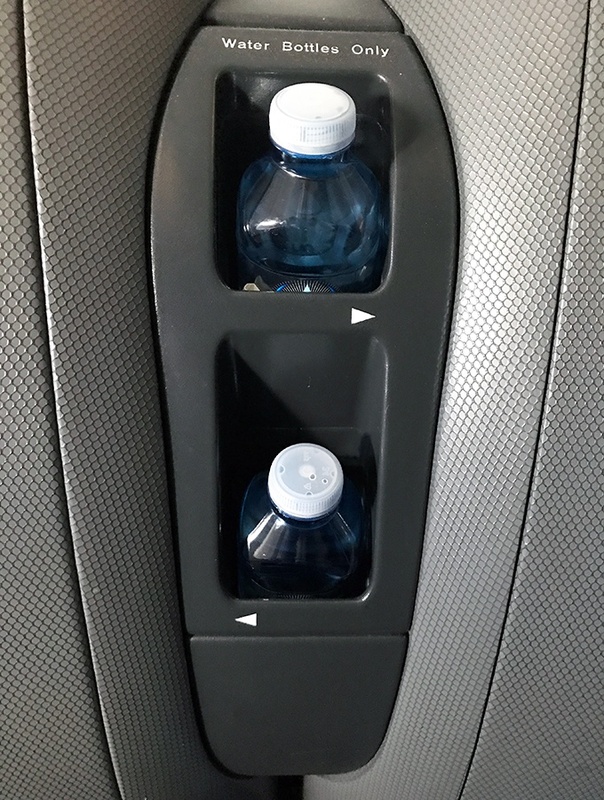 There is also a choice of water or juice. Every flight should start with a glass of sparkles! There are 36 seats in business class, in a 2-2-2 layout across two cabins. The business class section is split into two with the galley in between. This creates two smaller cabins with 18 seats each. Not all seats have aisle access and if you have a window seat you will need to jump over the person next to you. On day flights or travelling as a couple, this isn’t an issue. But at night with seats laid flat, there is a bit of straddling going on. Sadly they are the older than Methuselah pod seats. 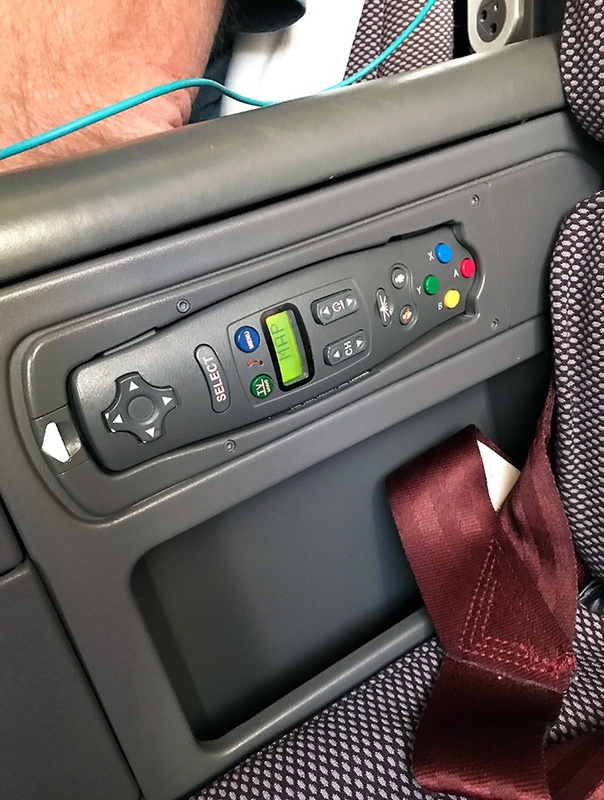 Thankfully Qantas are slowly ripping these babies out and replacing them with their business class suites. They are looking old and feeling old. Padding in the seats is on the worn side after years of use. They are a “flat” bed seat, but they aren’t flat horizontally. If you do recline all the way to sleep you will be on an angle. 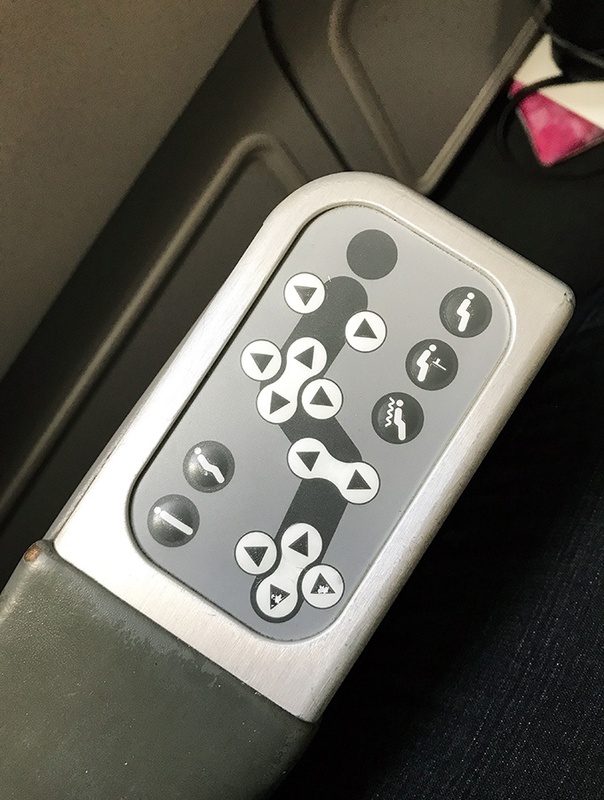 They are the worst business class seats (besides the domestic ones that fly to Bali and some NZ flights that don’t fully recline) for overseas travel in the fleet. But yes, when push comes to shove I will take one of these over economy any day. The seats are also a little lacking in storage. 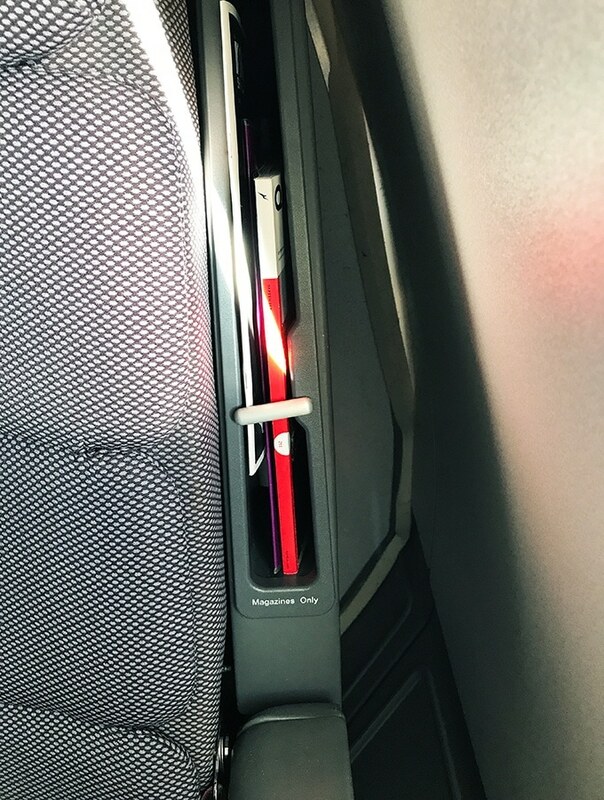 There is plenty of storage in the overhead bins, but not many “hidey holes” to store things like iPads, phones, books, reading glasses etc. The entertainment screens are small and very dated as well. The same entertainment is offered across the fleet with an okay selection of movies and TV shows, as well as music. Noise cancelling headphones are also supplied. Controller for Entertainment Unit. There is a touchscreen but it is unreliable. As our flight left Sydney at 4.45pm and arrived in Singapore just before 10pm we didn’t sleep nor wished to. Blankets weren’t offered, but if you asked they would bring you one. Amenities kits were handed out before take off. They were Kate Spade amenity bags, male and female versions. 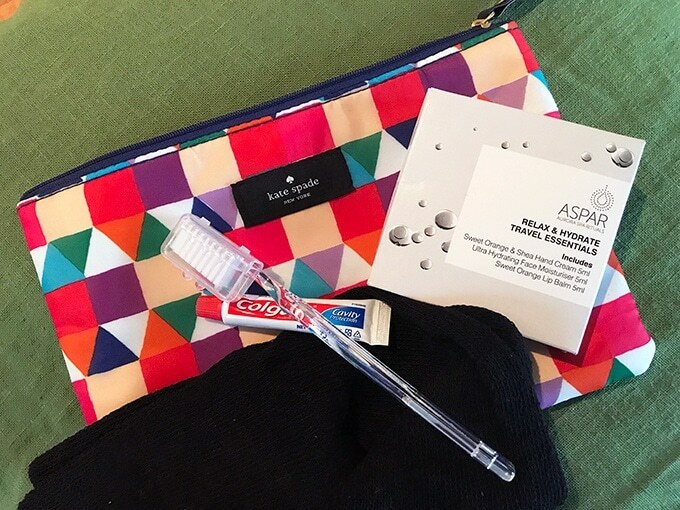 They included toothbrush and toothpaste, eye sleep mask (not pictured), socks, Aspar toiletries (hand cream, face moisturizer and lip balm) and earplugs (not pictured). There were two meals offered on the flight, dinner and a snack before landing. We start with pre-dinner drinks. 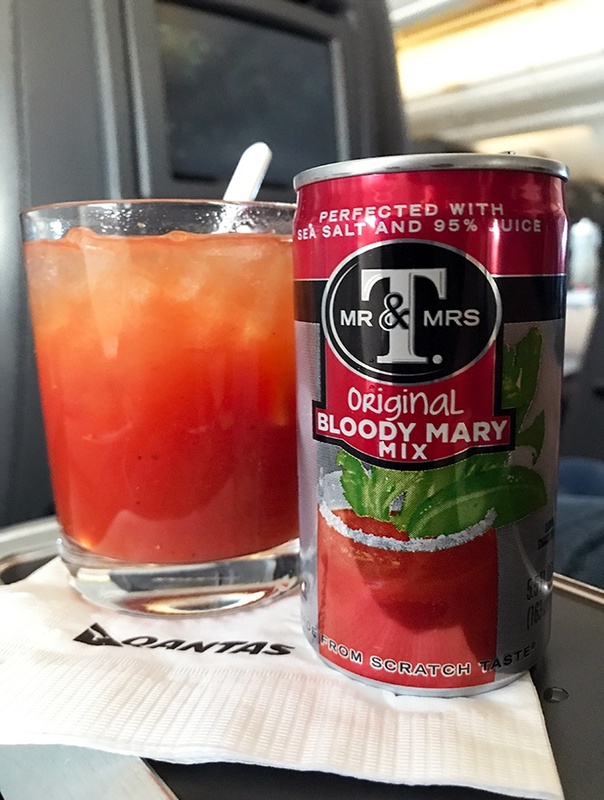 I rarely drink tomato juice or bloody mary cocktails, but I do on occassion order one when flying. Tomato juice takes on a totally different flavour at altitude. When flying Qantas you have the option of pre-ordering your meal. Sometimes I do and sometimes I don’t. There is always an online only menu item and if this looks any good I will order that. 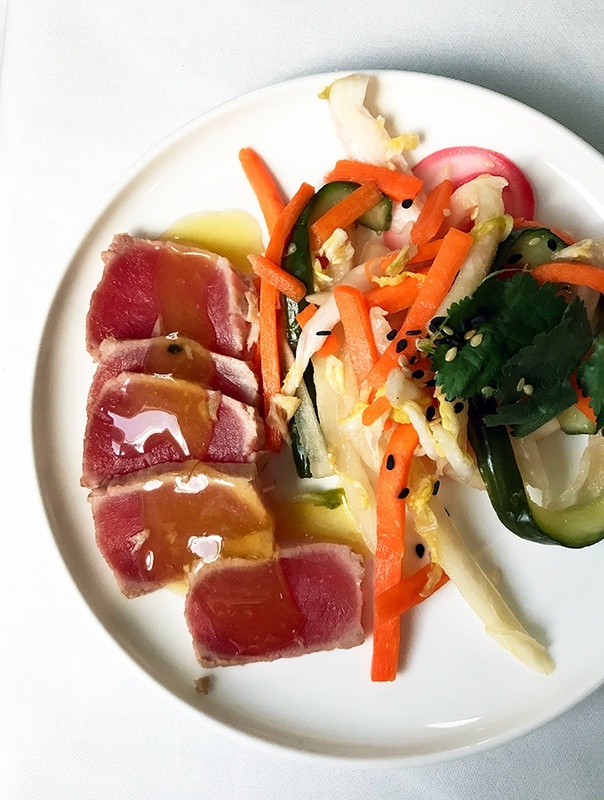 In this case, I did order ahead, but not the online only options as the Tataki Style Tuna sounded quite good. Alongside this bread and salad are served. 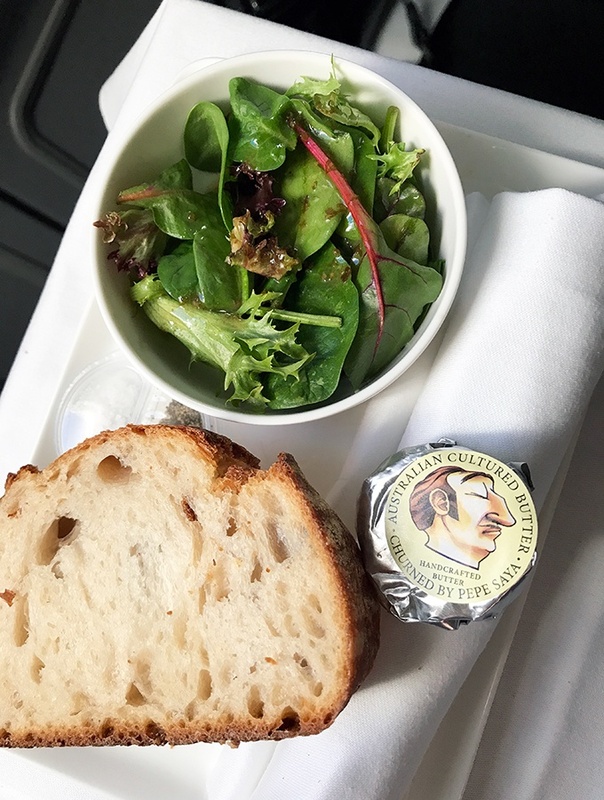 I love that Qantas serve Pepe Saya butter in business class on all international flights. 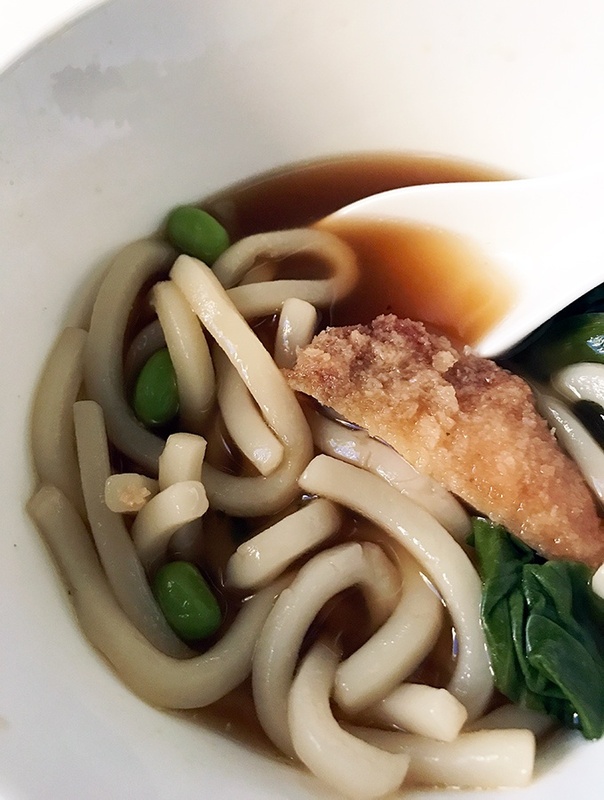 For my main, I had the udon noodles with tonkatsu. I was really happy with both the dishes. 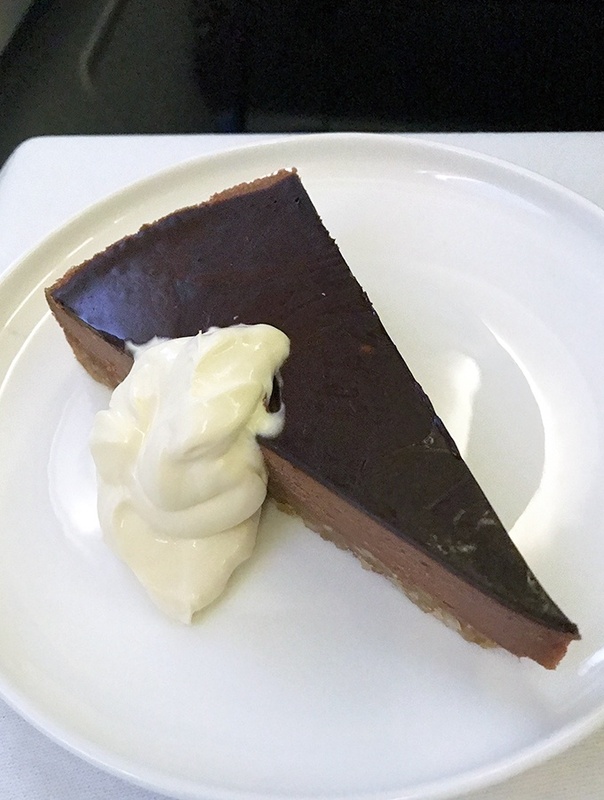 What I have discovered with Qantas is that their in-flight catering can be very hit and miss. On this occasion, it was a hit. Mac ordered the farro for his main. The nice thing about travelling with somebody you know is that I’m not asking strangers if it is okay to photograph the meal…… Yes…… I have done that in the past. He polished it all off with no complaints. It was actually a rather substantial dish. For dessert I indulge with the chocolate glazed cheesecake with creme friache cream. 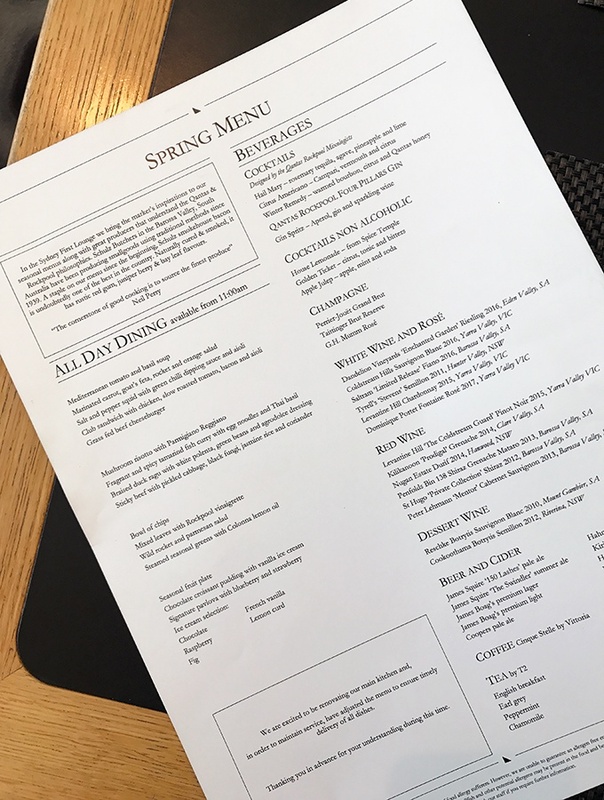 The other options are a cheese plate or ice cream. I may have indulged in the cheese plate too (oops). 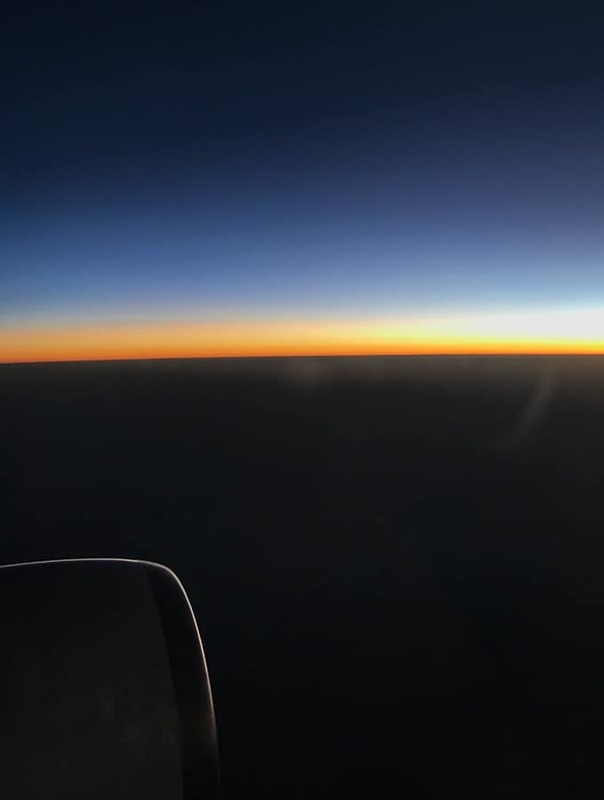 One of the great things about the timing of QF005 is that you can watch the sunset over the magical Australian outback. 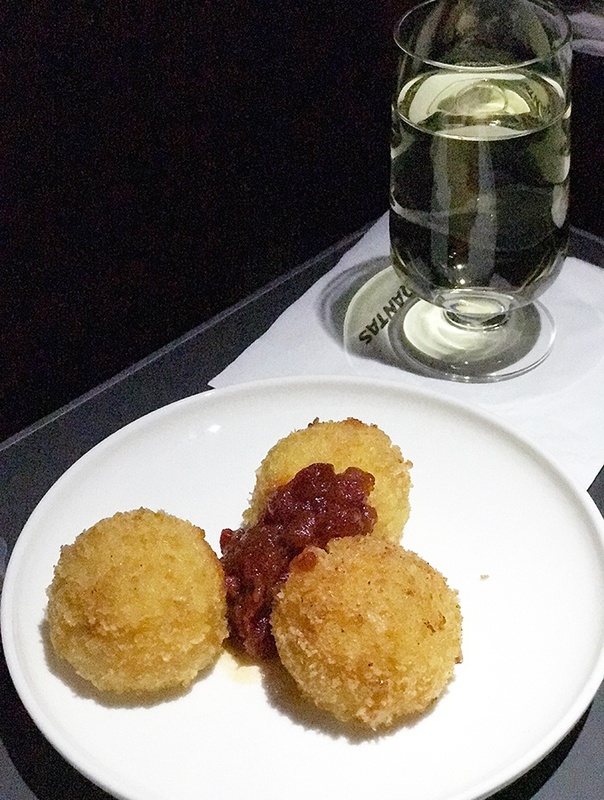 The flight was just over eight hours and Qantas offer a snack before landing. 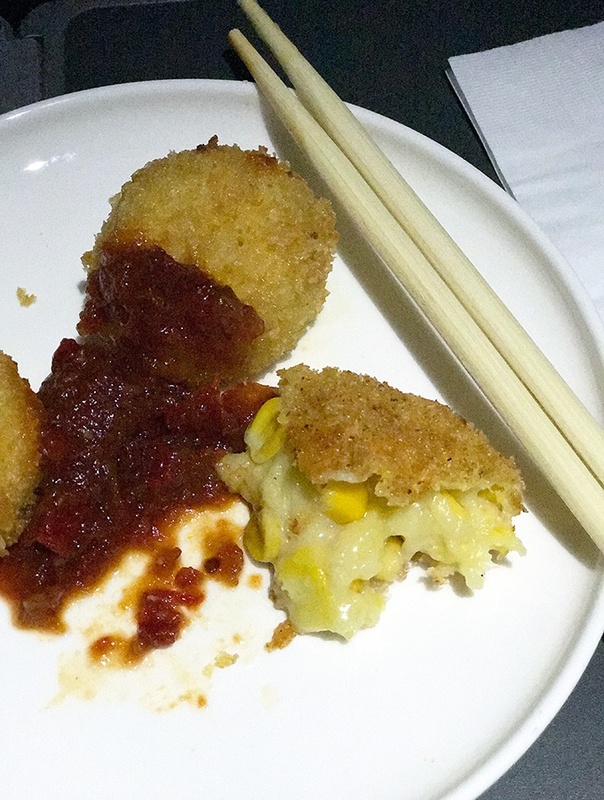 The snack was arancini served with a tomato sauce and chopsticks. A gentle reminder of where we were about to land. It’s important to note that from March this year (2018) Qantas will resume using Singapore as their hub once again on flights to Heathrow. At the moment it is Dubai. Therefore they will now offer three gateways to Europe, Perth, Dubai and Singapore. This also means when the changeover in March happens, QF1 will resume flying via Singapore with an A380 back on this route. An additional flight from Sydney to Singapore will be flying, QF81, this will be an A330. Hopefully, it will be a refurbished one for you! I frequently travel QF to both LAX and LHR. I am looking forward to bypassing Dubai and transferring in Singapore. Business class is definitely worth flying if you need to arrive fresh and ready for the day ahead. I have traveled in first class which is again a lovely way to go, but when traveling with my wife we prefer business and seats 11A-B or 11J-K. Seating by the window offers extra side storage. The lounge area in the front of business class is a bit of a hit and miss. There is a screen, magazines and a lounge. 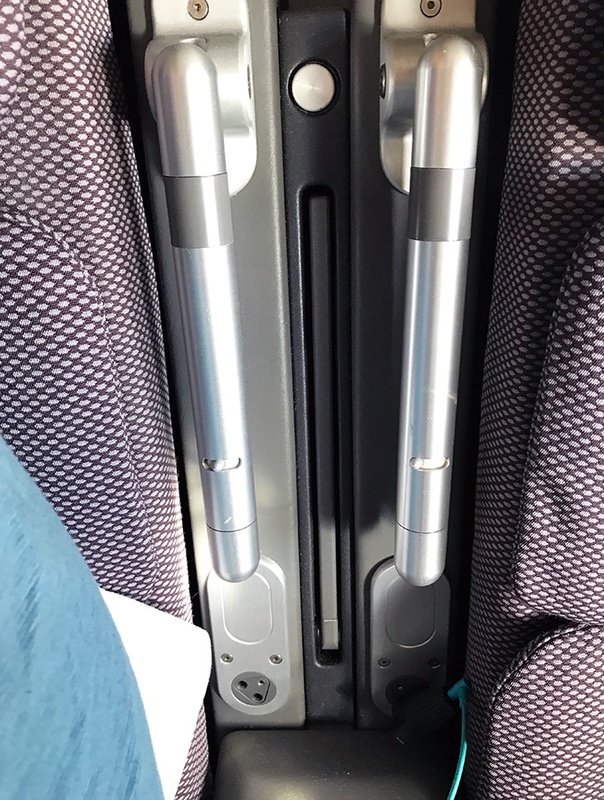 But if you need to have a bit of space to work without disturbing other passengers, this area is useful. I also have interesting conversations with passengers in the lounge. It’s a tad expensive but depending on your budget and reasons for the upgrade status it will be worth it. I am heading to LHR via Singapore this week and I am hoping that I can experience the refurbished business class. 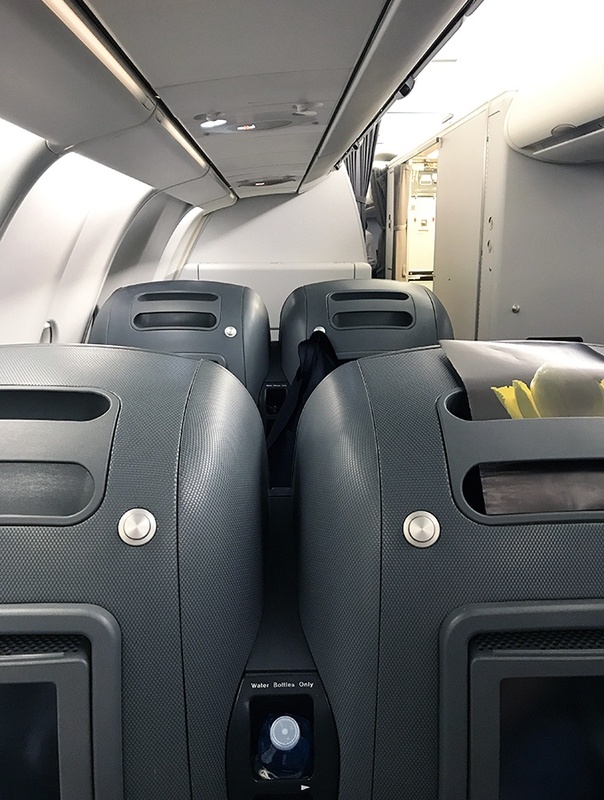 Qantas finished their refurbishment program of the a330s last year. Two -200 series aircraft remain in the old configuration however as they are under different leases due to expire. So very unlucky to get one of these remaining planes! This sounds great. I think I will have to spend more funds and enjoy the flight more. Long flights can really get to me. Business class looks amazing. The food makes it seem more like a 5 star restaurant than a long plane ride. 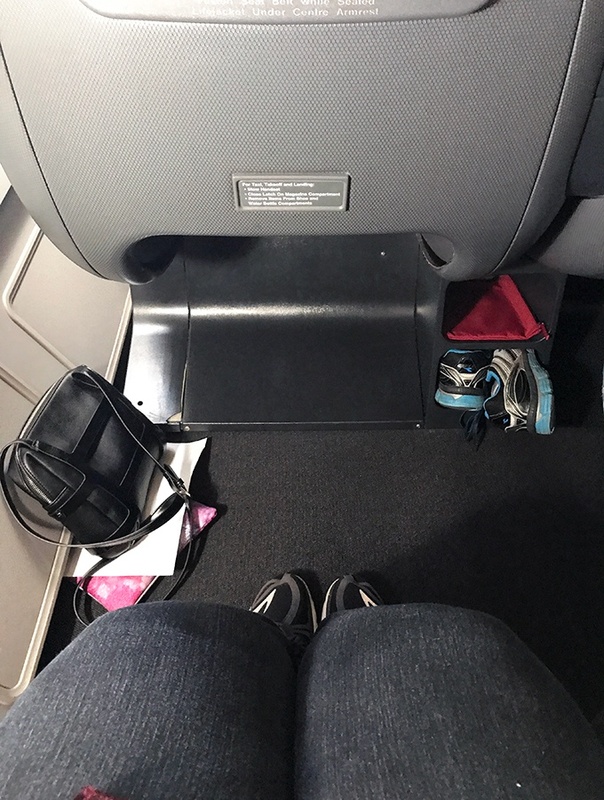 The extra legroom would make the flight so much better. Goodness, this flight looks out of this world! 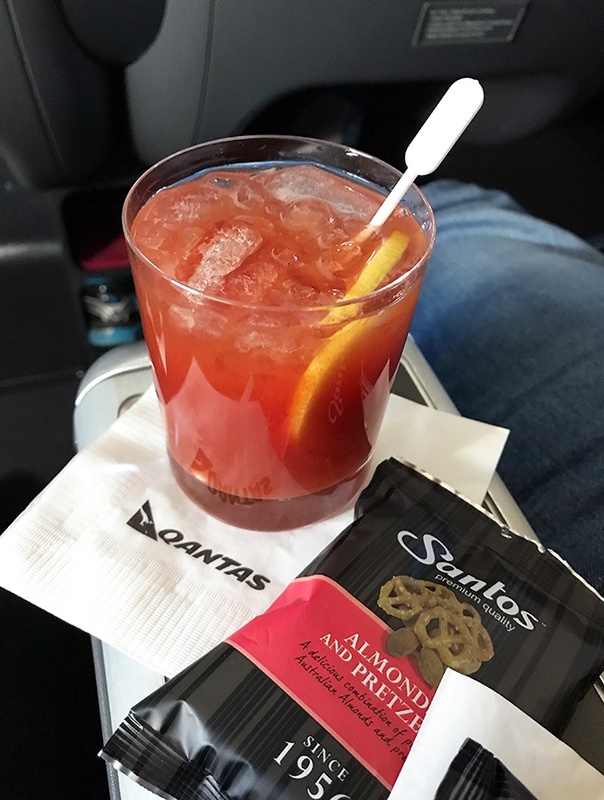 I have never upgraded on a flight and I can only imagine what a special treat it would be – I’ve heard great things about Quantas in any case. 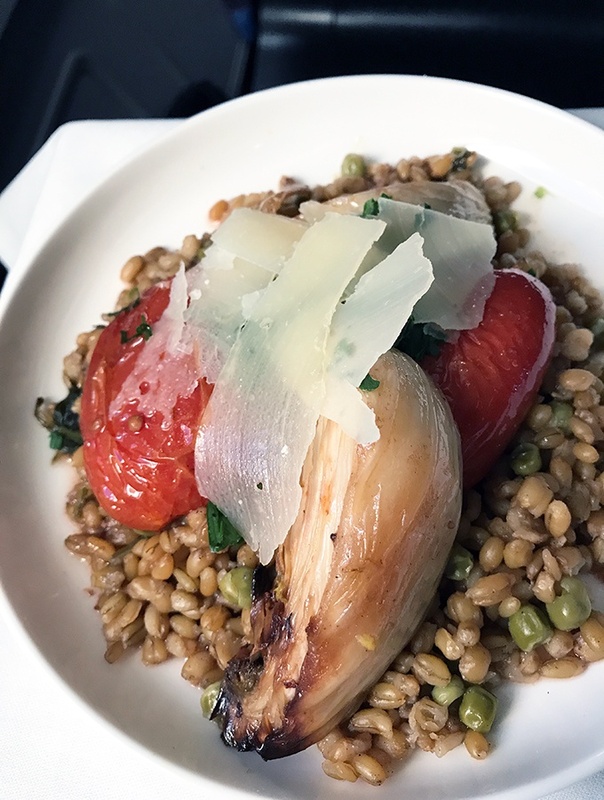 I love the idea of feeling rested and refreshed when landing, and because you’ve had better food and drink you’ll feel raring to go when you land. One for me to save up for! I am a platinum Qantas member and have somehow yet to fly business class on Qantas. Love the status mainly for the airport lounges which are incredible. I did fly Sydney to Singapore Business which seemed to have a lot more room than the photos show here for Qantas. Cheese plate! Favourite! Looks like you’re in a restaurant! HAven’t tried Qantas business class but I will take Qantas economy this April and I’m excited ! ( even tho not business! lol ) I’ve known Qantas is one of the best airlines and has great service aboard! Did you like the tomato juice? I like tomato jam! haha back in my hometown! 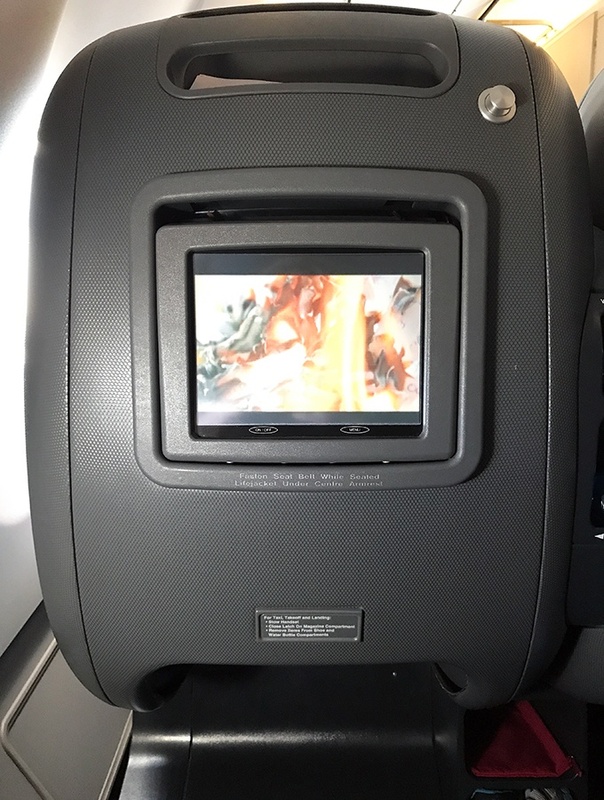 I have heard that Qantas are one of the better airlines and although I can see you weren’t impressed with many things such as the quality of the screens, etc, it is good to know that they’re slowly renovating their flights. Goes to show they care enough to take initiative in providing better quality service to their passengers. I have never really flown business class so I can’t say much about other airlines but it seems the service is pretty good in Qantas! I have not travelled on business or first class yet, to be honest. So definitely it would be a wonderful experience if I will have the opportunity to travel in style in the future. On a Qantas plane hopefully! I love reviews like this because I can get an unbiased opinion about business class. I don’t usually travel business, but if it’s a long flight like this it may be worth the money. 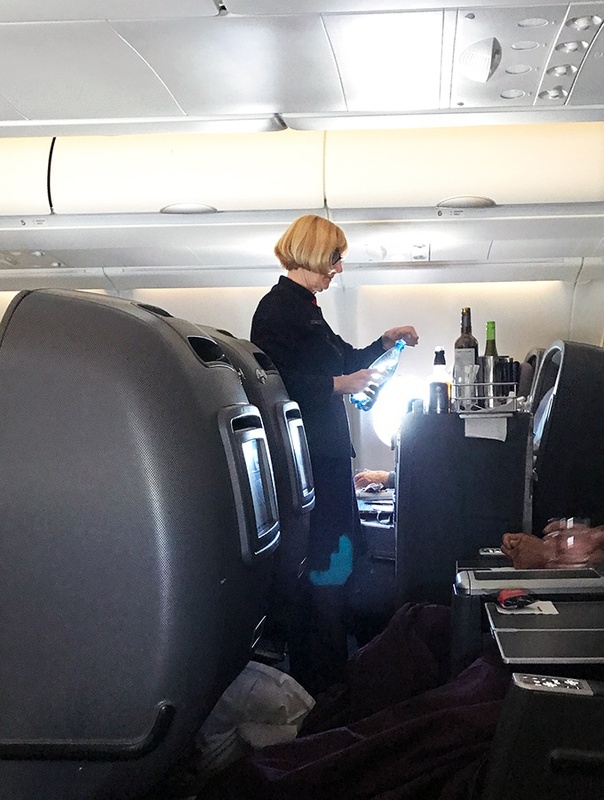 It seems the food and comfort are exactly what they should be for business class. I have never travelled business class, but I imagine it to be great on long-haul flights. Alone the additional space I could have only dreamed of on some flights I did in the past. 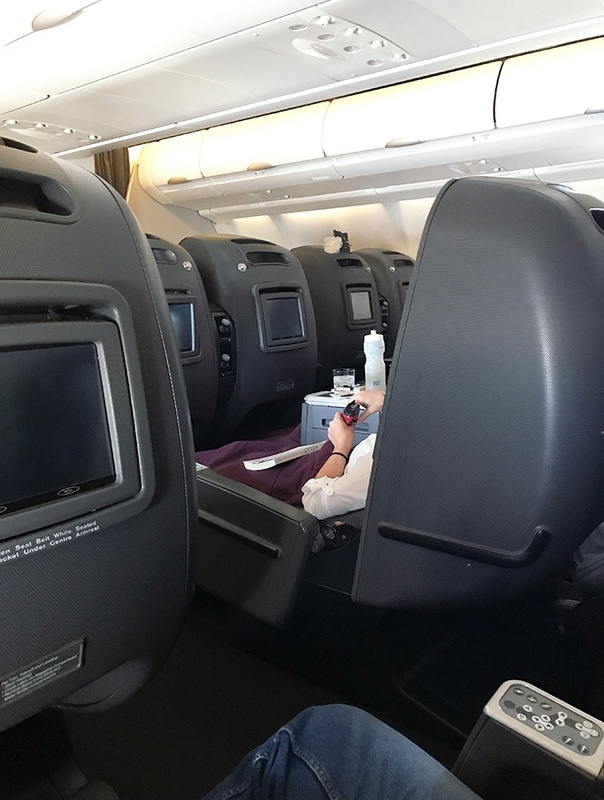 Do you travel business class often? Business class is so nice. I have flown to Europe several times on BC and you feel so rested when you reach the country. The Singapore airport is super nice to and a great place for a hub. This sounds like a great connection all the way around.